Cambrooke Therapeutics cofounder Lynn Paolella of Wayland. When Lynn Paolella’s two youngest children were born with a rare metabolic disorder called phenylketonuria, or PKU, the only treatment was a lifetime spent avoiding most foods. Her kids couldn’t eat meat or fish or milk, pizza or mac and cheese. They couldn’t eat regular bread or pasta or eggs. Still, she fed them as best she could: vegetables and formula made from synthetic protein, low-protein bread that came in a can. But it felt more like deprivation. Her kids were always hungry. So she began experimenting in her kitchen, searching for more appetizing food. She tried different recipes and asked the advice of a neighbor who was a food scientist. She called companies such as Dow Chemical, looking for ingredients and guidance. In 2000, Paolella and her husband, David, started a small company they named Cambrooke Foods after their children Cameron and Brooke, who have PKU. Cambrooke has since grown into the world’s largest company providing food and medical formulas for people with PKU and other genetic metabolism disorders, with more than 80 kinds of foods — from pierogi and ravioli to brownies and scones. It also makes a special formula that serves as the lifeblood for people with the disease. A genetic metabolic disease wherein the body cannot break down an amino acid called phenylalanine, or Phe. The company, now based in Ayer, has changed its name to Cambrooke Therapeutics and is also developing formulas and foods for other genetic disorders. Since large corporations are often unwilling to invest much money into developing therapies for “orphan’’ disorders such as PKU, which affect only a small percentage of the population, families often struggle to find ways to raise money and develop treatment. When Cameron was born in 1992, Lynn Paolella remembers getting a call not long after she had returned home from the hospital that he had tested positive for PKU, a disease she had never heard of, in his newborn screening and needed further testing. She was stunned. When the new tests also came back positive, the Paolellas began to learn about phenylketonuria. The genetic disorder leaves the body unable to break down a specific amino acid in protein called phenylalanine, or Phe. In addition to avoiding obvious sources of protein, people with PKU also cannot eat a host of other foods, including traditional bread, pasta, and rice, because even they contain too much protein. Some vegetables, such as spinach and potatoes, must be limited. The stakes are high. If a patient eats too much protein and the amino acid builds up in their blood, it is toxic to the central nervous system. They may become intellectually disabled and can have seizures, develop emotional problems, rashes, and other issues. But people still need protein to survive, so many PKU patients get theirs from a special formula from which the offending amino acid has been removed. Low-protein foods are limited. “Back in those days, it was clearly understood by every clinic and every family that having PKU meant a life sentence of really bad-tasting food,” Paolella said. Paolella began trying to make better-tasting food, starting with bread. Although she got help from companies like Dow, they weren’t interested in making the food once they found out how small the target market was. 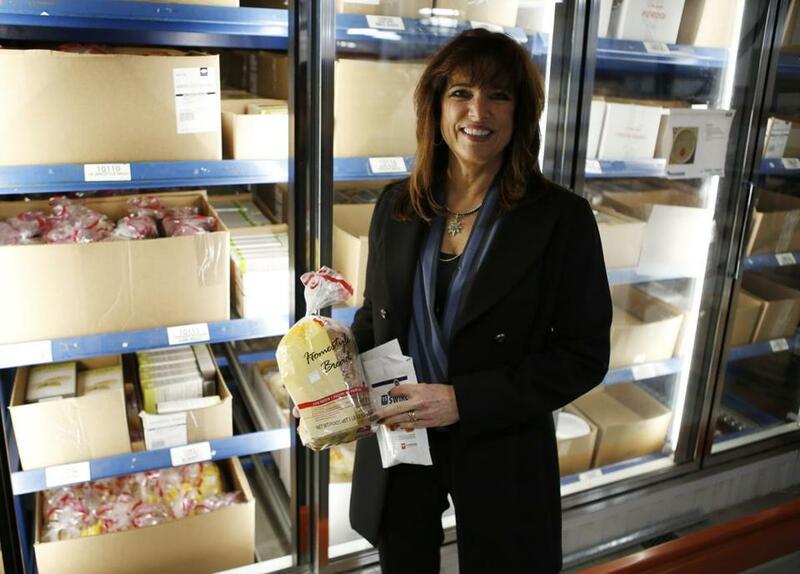 After Paolella and her husband, an architect, started their own company selling food that was safe to eat for people with PKU, the operation grew with their children’s tastes. When they asked for macaroni and cheese, Paolella said, she developed a recipe, and had her kids and their friends taste-test it. When they asked for pizza, she made that. Cambrooke also worked with researchers at the University of Wisconsin, who discovered a protein source, from whey, that did not contain the amino acid. For its formula, the company adds back other critical amino acids and calls it Glytactin. The Paolellas’ formulas were the first to use a natural protein source, which they say not only tastes better but keeps people with PKU feeling full longer. Synthetic protein moves quickly through the body, leaving patients feeling hungry more quickly than if they had eaten natural protein. Brooke Paolella, now 17, remembers being hungry as a child. She ate a lot of salads and french fries but found it hard to get full. After her mom created the low-protein bread, Brooke made the same snack every day after school. She’d fry tomatoes and garlic, add some cilantro, and spread it over a slice of bread to make bruschetta. When her parents found a company that sold low-protein pasta, and added that to their product line, it was a huge advance, Brooke said. “I still eat it,” she said. Even her friends without PKU liked it. She also became the first person to test a new formula — ready to drink, so it doesn’t have to be mixed from powder, like other formulas — made from a natural protein that tastes more like milk, she said. “It actually has a good flavor,” she said. Her brother, Cameron, is a senior at Champlain College, majoring in psychology. Brooke, a junior at Wayland High School, is interested in biology. She has thought about becoming a nutritionist.